Well actually, we’re already in Zurich. 🙂 We made it here earlier today – hurrah! After having to get up early for yesterday’s day trip though, it was nice to sleep in today, since our train didn’t leave Munich until about 1230p. We were once again on a DB Bahn train and it went as smoothly as could be expected. After using them for trains to Prague and Zurich and a bus to Munich, I have to say I was really pleased with their service. When we booked everything originally, I wasn’t sure about the bus we took to Munich (only because I’d never used a bus to get from country to country before), but that was actually the most comfortable and efficient! Go figure. 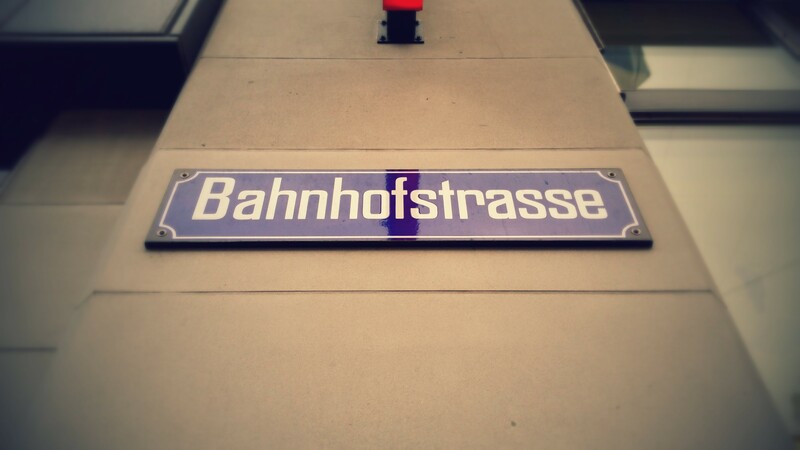 Their train service was nice as well though, so if you’re traveling to or from Germany, I would definitely recommend using them. Since we didn’t arrive in Zurich until 445p and didn’t get into our apartment until about a half-hour later, we didn’t have a lot of time to see much in the city tonight. However, the forecast is calling for rain tomorrow, so we wanted to at least do some exploring, so after settling in (and waiting for a brief rain shower to end), we did exactly that. We did have to use our umbrellas for a short time, but the crisp air and cool temperature actually made walking around really pleasant. 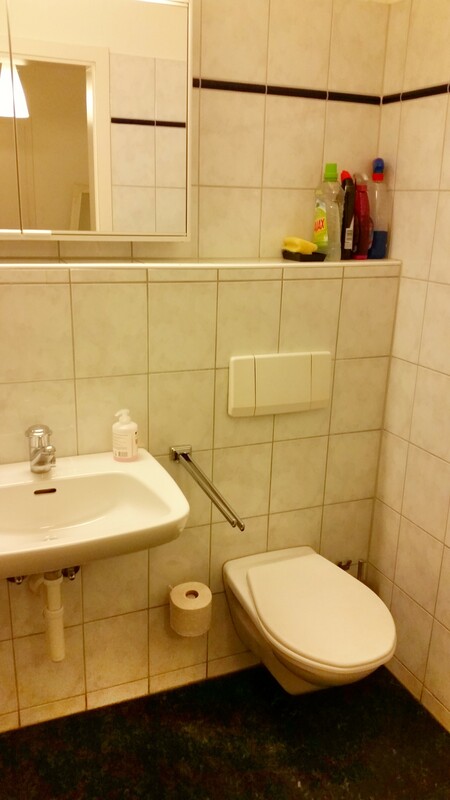 In looking at our to-do list for Zurich in comparison to our apartment’s location yesterday, it seemed like we would be ideally situated to see everything. That is definitely the case! 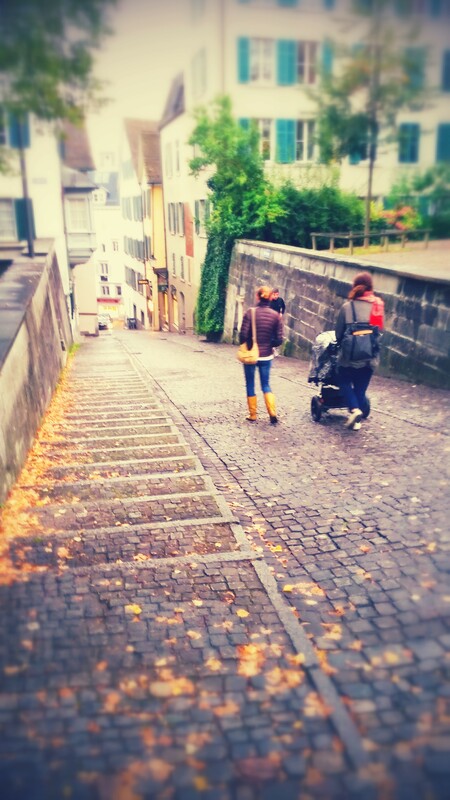 As we set out tonight, we aimed for Zurich’s Old Town, which is just across the river from us (maybe a half-mile walk). 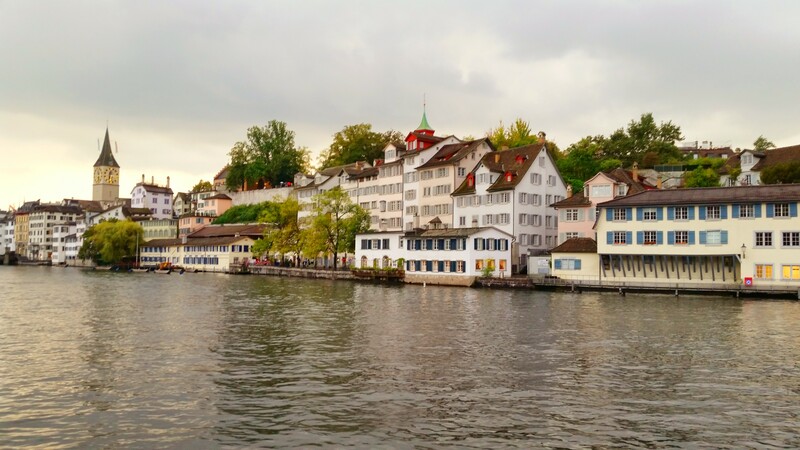 As with many “old towns” in other cities, there are some cool buildings, nice shopping, and good restaurants all to be seen in Zurich’s version. 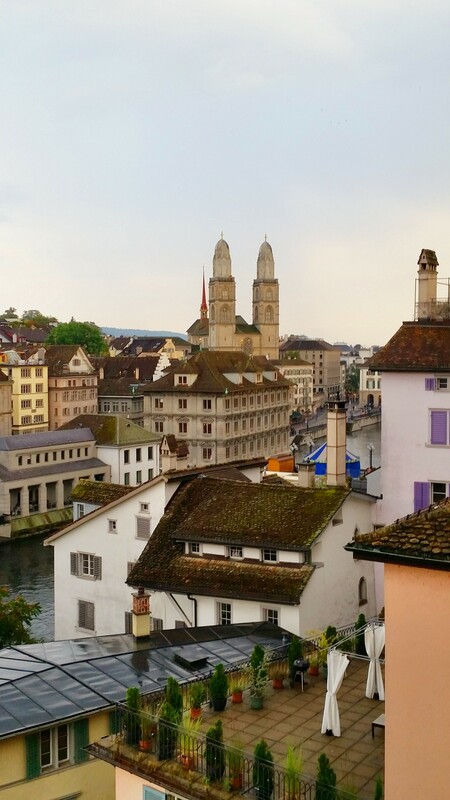 After a quick walk down Zurich’s Bahnhofstrasse (fancy shopping, mostly), we headed for Lindenhof Hill, which is supposed to provide some nice views of Zurich. After climbing numerous such hills in the past, I assumed it would be a big climb, but it wasn’t at all. And the hill is in the Old Town anyway, so we didn’t have far to walk to reach it. 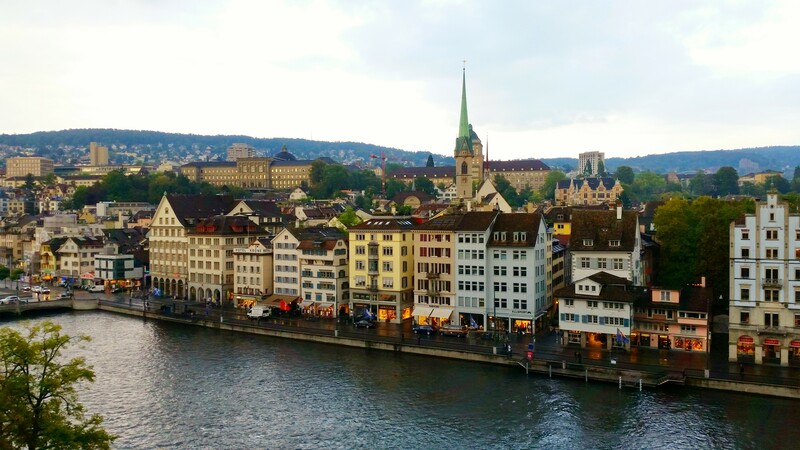 There are indeed some excellent vistas from the hill, so be sure to visit it the next time you’re in Zurich. 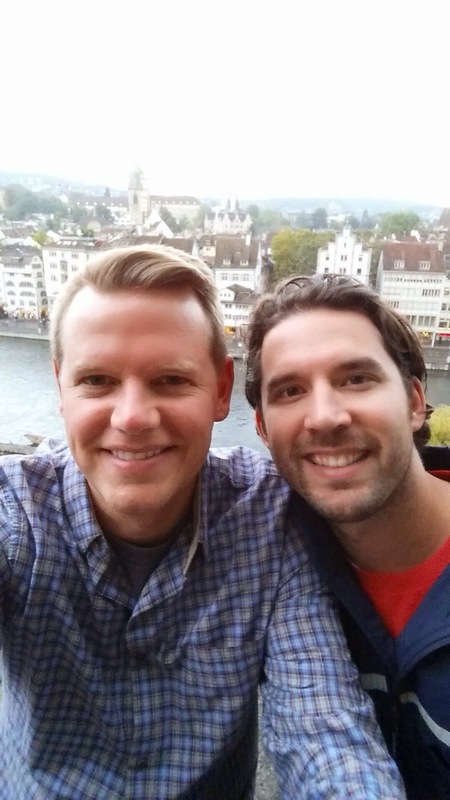 From Lindenhof, we kept winding our way through the Old Town and found ourselves walking along the river, which also provided some great photo opportunities. 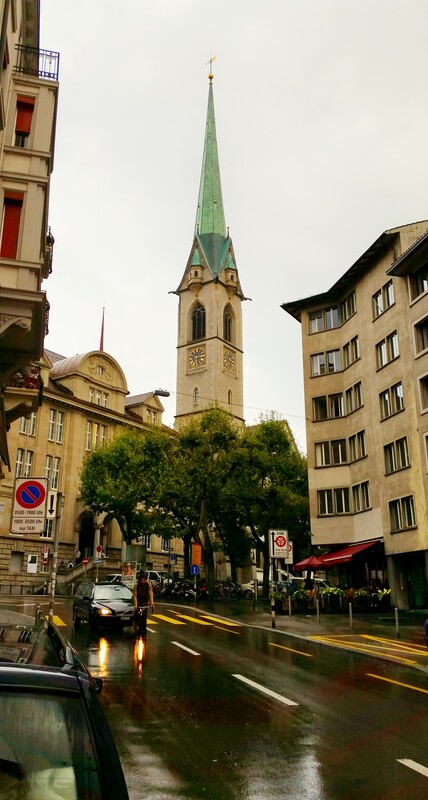 We saw two churches – Grossmünster and Fraumünster, both of which are old and well-known. It was already past 7p by the time we got near them, which was past closing time, so we couldn’t go inside, but we look forward to doing that tomorrow. In the meantime, the exteriors are pretty sweet! As is usually the case, we figured we should get some food at some point, so we unknowingly went to a restaurant that was on our list of things to see anyway. Zeughauskeller is actually pretty similar to the Hofbräuhaus in Munich, though it’s not as big – full of people, sharing tables with randoms, lots of beer, and German food. The place was packed tonight, but I kind of think it’s more of a tourist trap than anything else. 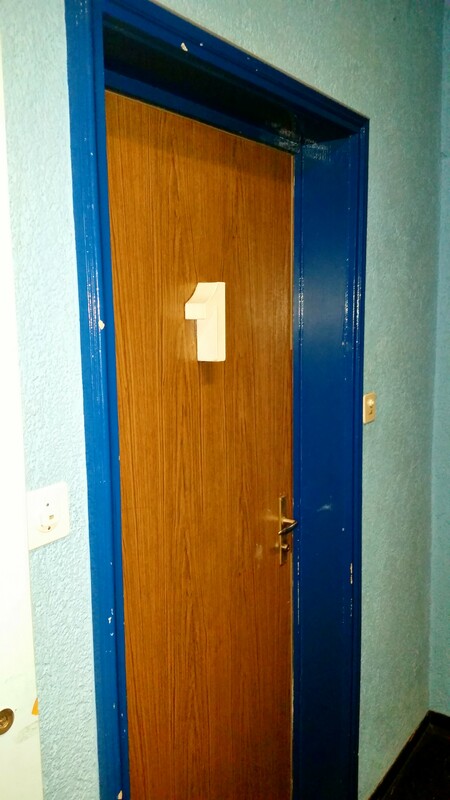 To be honest, I wasn’t that impressed. The food was decent, but very expensive (we paid over $80 USD for two entrees and two soft drinks). Also, Scott ordered a tasty-sounding cordon bleu (with pork instead of chicken), but what he received was basically a beef stroganoff. While it wasn’t bad, it wasn’t what he ordered and it was more expensive to boot. When you’re looking for a place to eat in Zurich, I would skip this one. 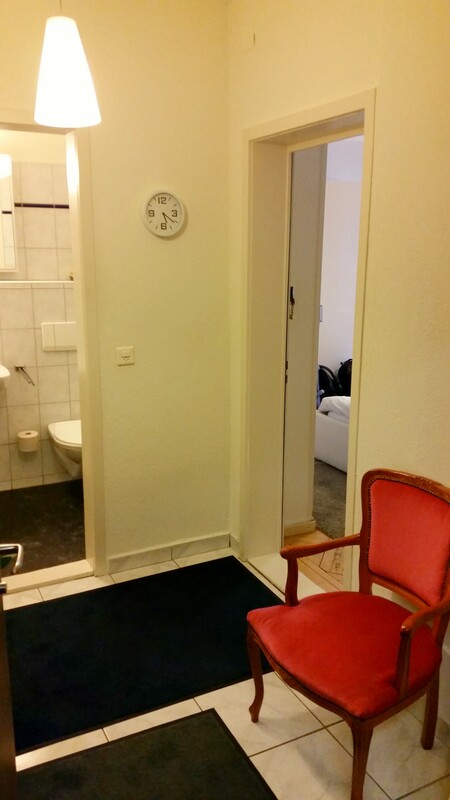 The entryway, with the bathroom straight ahead and living area to the right. 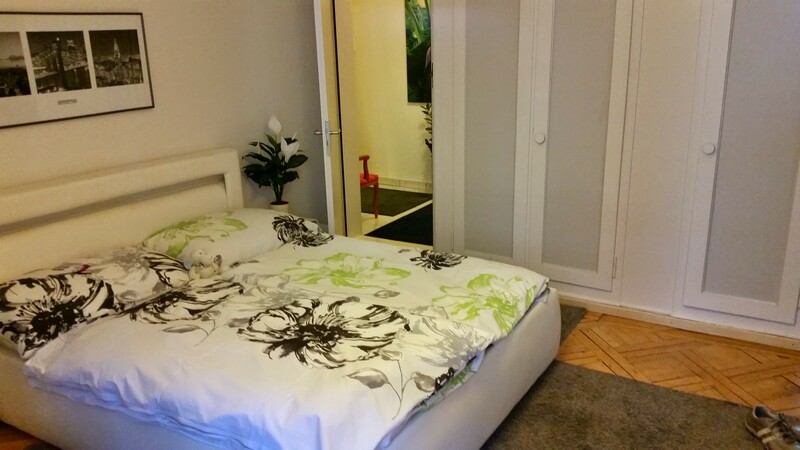 The small living area. 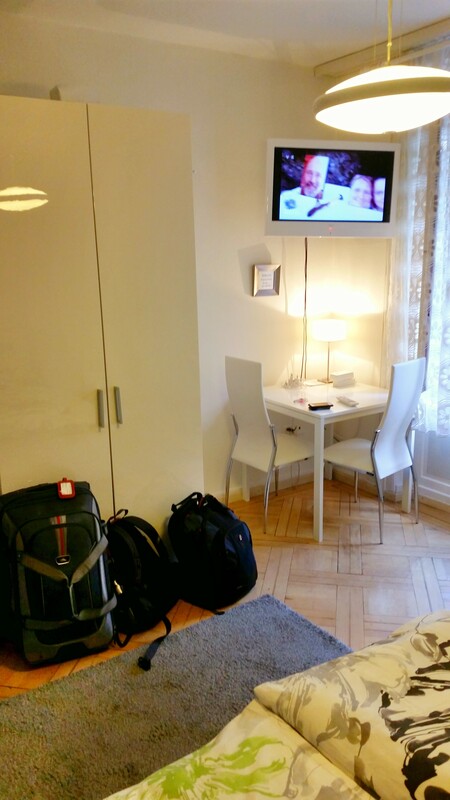 This apartment definitely skews more studio! 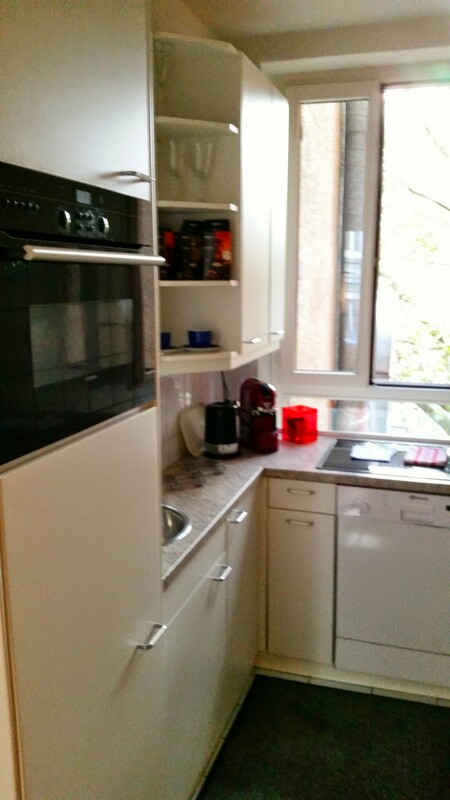 Our apartments always have really functional kitchens! 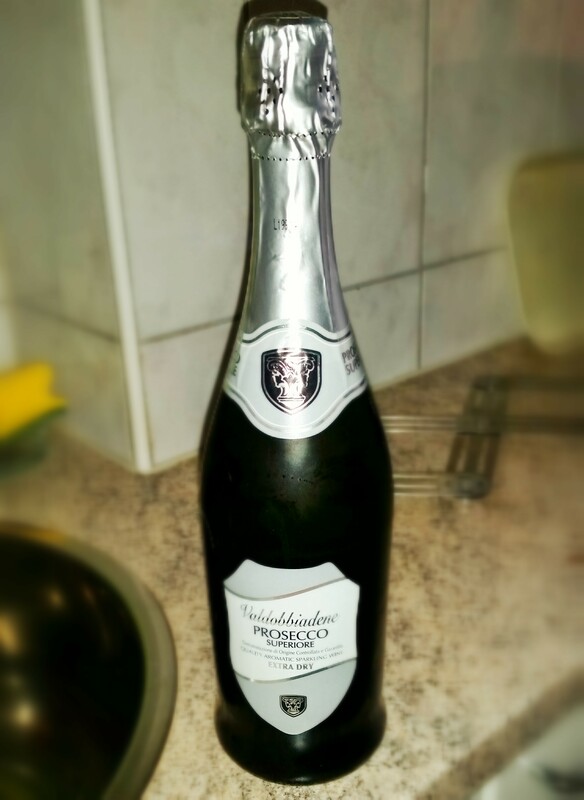 Our host even left us a bottle of Prosecco! Not sure if we’ll drink it, but the gesture was very nice. 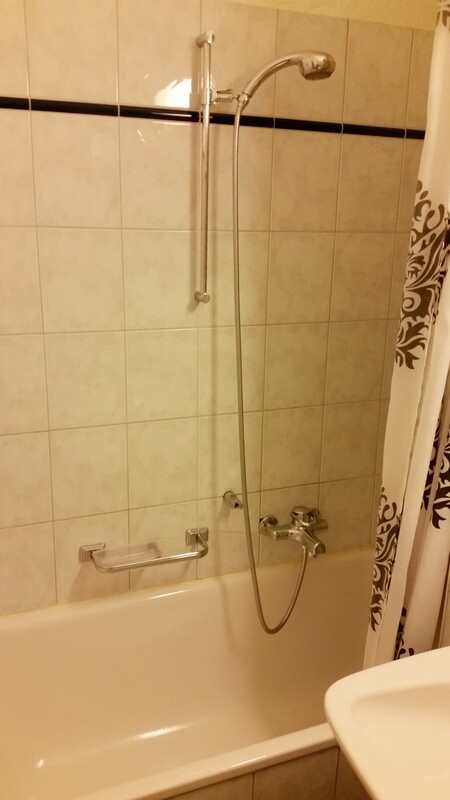 Decent-looking shower. Hope the water pressure is good! The view just outside our apartment. Looking towards the Old Town as we cross the bridge. Taken from the top of Lindenhof Hill. See, not a bad walk! 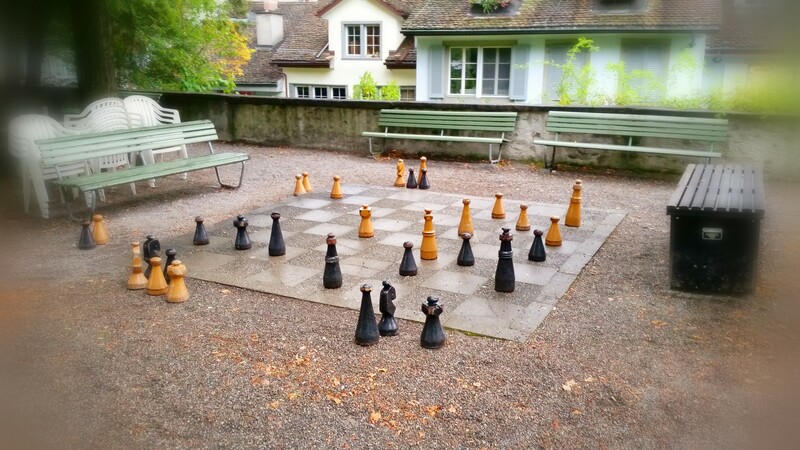 There were a few of these huge chess boards on the hill. 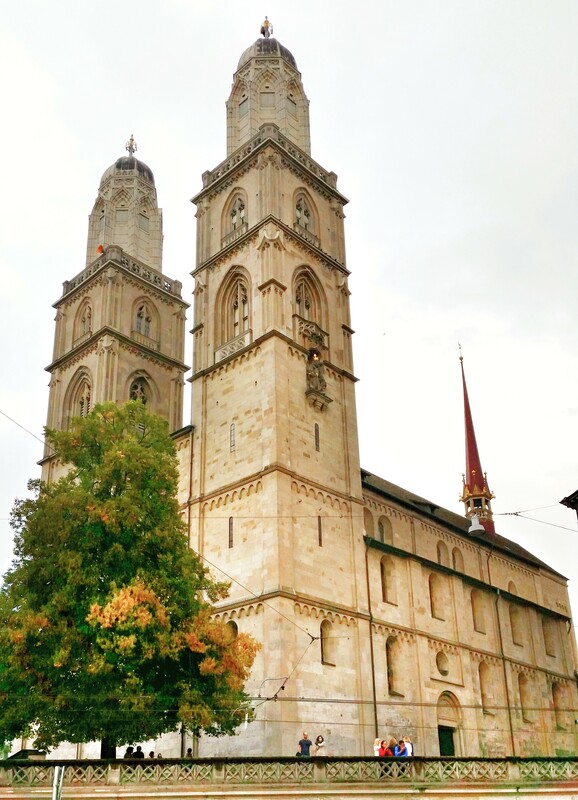 The church with the two towers is Grossmünster. Looking forward to seeing the inside tomorrow. Love this panorama, minus the crane thing on the right side. 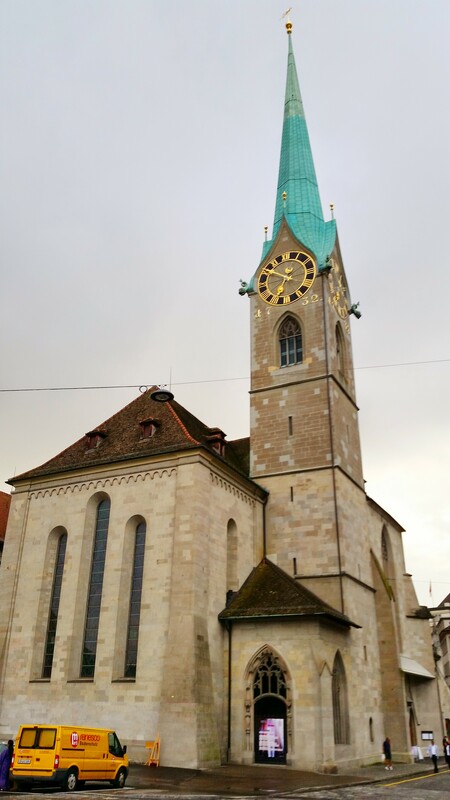 A closer view of Grossmünster after we walked down Lindenhof and further into the Old Town. Up close and personal with Fraumünster. 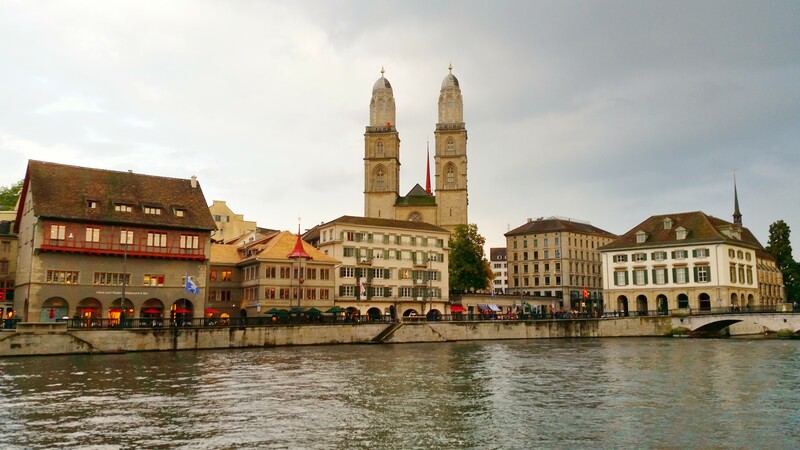 We crossed back over the river where we could see Grossmünster from the street just below it. Panorama from the Grossmünster side of the river, with both Fraumünster and another church, St. Peter, visible. I feel really good about our first half-day in Zurich! Since we knew our time here would be really limited, we didn’t plan to see or do a lot, but we saw some good stuff tonight, so I feel like we’ll have a great day tomorrow, our only full day here. Zurich is so beautiful! Great pictures. Agreed! Love what we’ve seen so far! Your host sounds very kind! Those huge chess boards are cool.